Thanks to some good friends I now have a large ex-BBC filing cabinet. This has 4 large drawers and is 1m wide by 1.2m tall. There’s a couple of concrete blocks in the bottom to stop it falling over when the drawers are open and a standard interlock to stop you opening more than one drawer at once. To fit this in place I’m removing one of the old metal shelves that was in place when I first moved into the house. That was a simple case of unbolting the shelves and unscrewing it from the wall. The bench was originally designed so the back would rest on these shelves. When it was modified for the lathe drawer I added in some extra legs in the middle so there was already some support at the back. 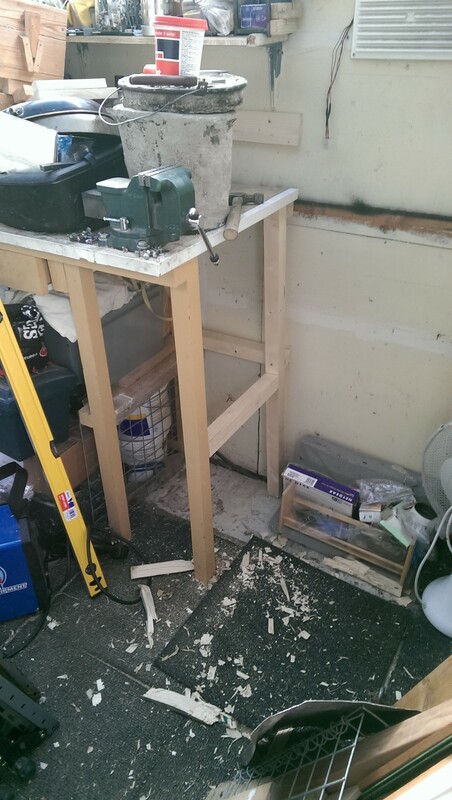 As this part of the bench is where I have my vice and hence do a lot of metal sawing, I thought it best to add another leg and also put in place struts so that I could add an extra shelf if I wanted to. 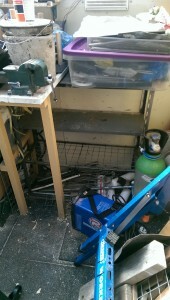 It might be nice to have some tall storage for things like welding rods so I may leave without a shelf. 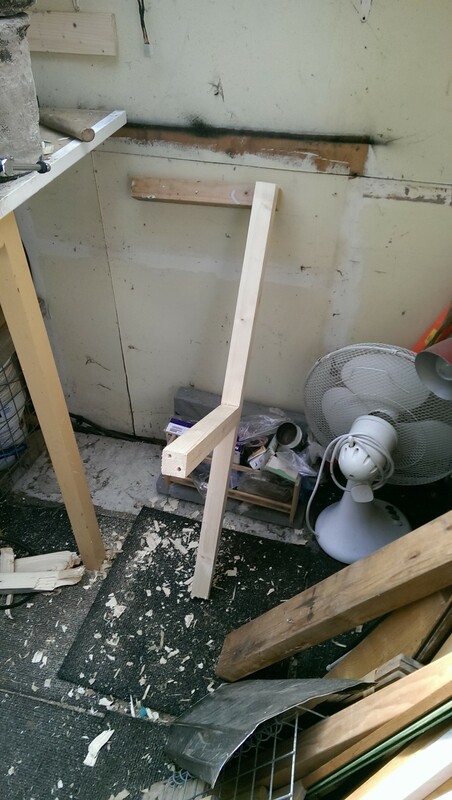 The legs were made from 40mm square softwood and I quickly realised that I did not have enough. 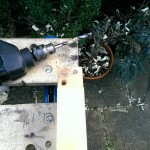 I did have some 80mm x 40mm so I split that with a hatchet and planed it square to make the missing parts. I attached the legs in the same way as previous using dowels and screws. 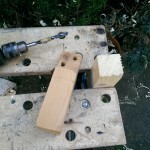 To drill the dowel holes I have a simple jig made from another piece of 40mm square wood. Two holes are drilled on a line 45° from one corner. The end of the wood is sawn as if you were making a tenon joint. Take care to ensure both shoulders are the same length. Depth is not too important but I went for 1/3s for this particular jig. Finally label each side, I picked F and B for front and back. To use follow the instructions on the pictures below. Once you’ve drilled one piece. 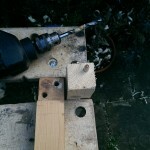 Reverse the jig to drill the holes for the mating part. Take care to drill straight so that you don’t damage the jig. With careful use the jig will last you for many uses. 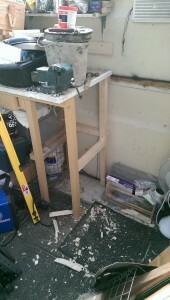 Now that the bench is full supported I can continue the mammoth job of making space for the new drawers.